Please click here to return to the paper on US politics. (Translated by Ed.) The rich world worked long and hard, through terrible centuries, in order to create its wealth base. Once it felt itself wealthy, however, settled down to consumption as a life goal. This happened some decades ago. It began to build a new consensus, a social consensus around indirect consumption, giving a 'decent life' to every citizen. The highest luxuries of one decade became the basic features of a "decent life" in the next. In the period in which rich world GDP doubled, welfare expanded by a factor of ten. A strong sense of social entitlement grew up with this. It says that if you are a citizen, then a vast range of things are due to you merely by virtue of your birth. "Society" is supposed to bring you into the world, educate you, find you a job, keep you safe and healthy and eventually bury you. If it cannot not find you a job, then it is to house and feed you, and generally to look after you. In line with this, except in attractive activities such as sport or light entertainment, popular culture has abandoned the notion that striving after excellence is a fine thing in itself. The high culture of the time is to be the popular culture, as if alll that occurred in the Eighteenth century was bar songs and ballards. No Mozart for today, thank you. If something is simply too difficult to master in a few weeks, then the view is that you should not mind or be embarrassed by this, for such a thing is "elite" - not a part of "us" - and you can disregard it. This may be a post-Humanist stance. It may celebrate our essential animalism and the pointlessness of existence, save as it is justified by the brief flashes of an enjoyable experience, and by the avoidance of too many low points. This is a stance that strives to be above all kind, to hurt the feelings of the smallest number, to treat the citizen as a child. It may feel anti-authoritarian and free of constraint. It says that there is nothing you cannot do because you can safely stop wanting to do things before you hit the limits of your ability. in Catholic countries, these days that is a big plus. But it will not serve for what is ahead. It does not apply elsewhere, and the rest of the world is coming to our door. They are not sleep-walking in a comfortable dream. The discipline and the striving that I see elsewhere in the world is not being mirrored in Europe. In our Europe, there is little status given to scientists and technologists, whether it be social or financial reward. Rich people are regarded in a very negative way and the process of becoming rich is seen as being grubby and probably corrupt. Entrepreneurs are usually disliked unless they are charismatic and, ideally, young - then they are described as "surprisingly ordinary". Very few young people in Europe want to be entrepreneurs, as compared to other countries. When they are asked to describe an ideal career, it is to work in a company that will pay you enough to retire early, as banks used to be. Well, dream some more, children. Look, I'm not proposing some cult of personality around economic and technical success, but I do suggest that we need to re-think our public priorities. The public mood since the crash has been that "those kind of guys" - wealth creators, elite groups - "did this to us. Ordinary people should protest to get it put back the way it was." I see these people in the streets here in Spain every day, waving placards. I hear teachers - a lot of teachers - arguing against an education that emphasises striving, work discipline, winning, success. That may make me an authoritarian old woman, but I know what made the rich countries rich, and it is not all being nice together. Re morality: John Stuart Mill in Nature, the Utility of Religion, and Theism "… Nature cannot be a proper model for us to imitate. Either it is right that we should kill because nature kills; torture because nature tortures; ruin and devastate because nature does the like; or we ought not to consider what nature does, but what it is good to do." One of the greatest steps our civilisation has taken in the past hundred years is to partially abandon Systems 1 in favour of Systems 2. If Mr (Professor?) Haidt cannot see that, then the worse for him. Congratulations to the authors of the Comment 4, which has for me made many things much more clear. I think people might be interested in this figure, which was made by Gelfand et al AAAS Science 332 pp 1100-1104 (2011) They looked at what they called 'tight' and 'loose' cultures. 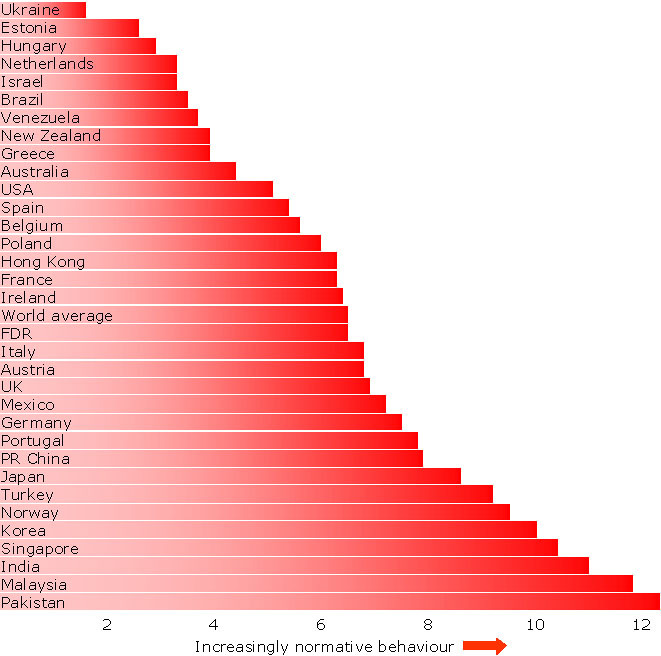 Loose cultures have weak social norms and are tolerant of deviance - so like the "Liberal" list - and the tight ones are very like the conservative list. "Tight" respondents agree with comments like: "People in this country almost always comply with social norms". The index shows responses from university students, which maybe understates the level of conservatism. The data show that the statistics are smooth within any of the countries and they are showing a clean difference between countries. The figure shows the result from 6800 interviews. Gelfand also found that it was strong the correlation with political forms (the chicken and the egg?) Also, it was good with environmental constraints like having desert, high population density, having suffered from a recent pandemic disease or a recent war. This figures sets me asking two questions. One, if everyone is the same inside, why are we so different in a group, outside? It is the stories we learn, of course. What we are hearing when we are a child, what they expect from us when we are growing up, what our teenage heroes do. But second, Hungary has big neo-nazi movement. I don't think Venezuela is very liberal, and I have been there a lot. Is Federal Germany (FDR) more liberal than the UK? So I read the paper again. The authors say that the top Liberal countries are not so much "Liberal", but countries that have lost their way, they have no national identity at all. Netherlands is the top true liberal country. But Greece, Venezuela? But I feel very happy with the bottom of the figure. Maybe Singapore not so happy- look where Hong Kong go? Amazing paper, Comment 4 about US politics. It seems to work really well here, as well. "Here" is Holland, where we are supposed to be very liberal but where we have a lot of Calvin tucked in the back pocket. I really want to comment on the main paper and on Comment 1. Look, I'm not going to pretend that everything is rosy, but to assume that it is the black spot which retards everything else in the world seems to me crazy. I see the European ideal as a bright spot in the world, something that is selfless and set up really to be better than what went before. Well, I say that, but what is this "ideal"? Romney's running mate Ryan has said that America was built on "an idea". I searched Google for "America + US + ideal", verbatim, and I got around 120 million hits. But then I did the same thing for "Europe + EU + ideals" and I got slightly less than 300,000. Is the US 400 times more loquacious about its identity, or 400 times less secure? Let's get to that in a minute. I want to pursue this "European ideal"
Ed: What follows is another excellent but lengthy paper. I have therefore posted it as a supplementary text, which is available here. I very much enjoyed the text about conservative and liberal psychologies. However, I have just come across a paper that suggests that you maybe have missed something. (It suggests to me that I have missed something about myself! Have a look here at the free on-line tests if you have similar doubts on reading this.) I explore why this matters in the last section. The area that you may have missed is the "Libertarian" mind set. The following is lifted bleeding from Iyer et al in PloS One. This work was done on a vast data set that exists as a result of people taking the tests indicated above - in this case, the work used data from 11,994 self-identified libertarians, 45% of them female. Presidential candidate Texas Congressman Ron Paul nicely sums it up: "The most basic principle to being a free American is the notion that we as individuals are responsible for our own lives and decisions. We do not have the right to rob our neighbors to make up for our mistakes, neither does our neighbor have any right to tell us how to live, so long as we aren't infringing on their rights." American political divisions and cultural references are reported as though they ran from one pole - liberal - to another, usually terms 'conservative'. The conservative insists that there is an objective moral truth, embodied in traditional social and state institutions. Liberals believe that moral truth is a work in progress, aimed at generating greater universal well-being. As reported in the earlier paper, it is possible to measure these views objectively. AS measured by psychometrics, political conservativism is associated with a tolerance of inequality, greater conscientiousness, intolerance of novelty and greater sensitivity to disgust. Political liberals empathise more strongly, and are thus less tolerant of generic sources of unhappiness or yearning, and tend seek out novelty and new capabilities. Both have their morality rooted in what the earlier paper called System 1, the reflexive, emotional view that a course of action is "just right", or that a situation is innately "wrong". Let me get back to this very important distinction. Then we encounter the Libertarians. John Locke wrote: "The great and chief end, therefore, of men's uniting into commonwealths and putting themselves under government is the preservation of their property", where 'property' was to include men's "content, lives, liberties, and estate." The US Founding Fathers were strongly Libertarian, as were most Enlightenment minds. Libertarianism rejects the idea that the needs of one person impose a moral duty upon others. It retains Locke's and Mill's notions of liberty as being identical to freedom from interference, what the philosopher Isaiah Berlin later called "negative liberty" - that is, freedom "from" interference. For Libertarians liberty in both these senses supersedes all other moral considerations. Libertarians seem willing to reject both liberal concerns for social justice and conservative concerns to respect existing social structure when those concerns conflict with individual liberty. That extends to an indifference to the consequences of dropping these concerns. How do Libertarians differ from Conservatives and Liberals? Libertarians value liberty more strongly and consistently than liberals or conservatives, at the expense of other moral concerns. Libertarians rely upon emotion less – and on reason more – than will either liberals or conservatives. They will pursue logic to hard ends. Libertarians are more individualistic and less collectivist as compared to both liberals and conservatives. An imperative to avoid acts that cause or risk actual harm; a duty of care. Reciprocity and fairness: unwritten rules of conduct that apply bidirectionally. Loyalty to the in-group, giving preference to your family, close or distant affiliates. Respect for authority, whatever its nature or objective strength. Concern for bodily or spiritual purity, for the sanctity of nature, places, rites. Libertarians view all but the first of these dimensions as essentially meaningless. They are odours they do not smell, notes they do not hear. In general, however, the West "hears" the first two of these. It directly opposes in-group loyalty - nepotism, exclusion of people by virtue of class, religion or ethnicity - and is suspicious of notions of patriotism and religious triumphalism. The West does not revere sources of authority unless they have objective evidence to support them. What is seen as pomposity - 'dignity', elsewhere in the world - is subject to ruthless satire and erosion. The West has little time for notions of purity or sanctity. These attitudes are broadly opposite to those held by the many billions who do not live in the Western tradition. Many of the young now hold views close to Libertarianism. Liberals will find the impact of these billions very difficult to accept. We return to this in the conclusion. The data that have been collected by this study are shown in the figure. Liberals and Libertarians run together on several of the fundamental dimensions: they both deprecate preference for the in-group, dislike 'underserved' respect for authority and ignore issues of purity. Libertarians and conservatives are, however, very similar - that is to say, largely uninterested in - issues of fairness and reciprocity. Looking at the vertical scale, liberals are concerned with life-style liberty above all, but with a strong need for with a safe and what they see as a fair society. Conservatives feel strongly about almost every category, but most strongly of all about economic liberty - keeping what they earn - and life style liberty, meaning the freedom to choose a way of living which they may also choose to impose on others. Libertarians are most motivated by economic and social liberty, and a reciprocity which in essence says 'hands off what is mine and my hands off anything to do with you'. Libertarians who were tested showed lower levels of emotional responsiveness to issues of innate disgust - 'some things are just wrong, some things are dirty' - and they were low on empathy to the sufferings or otherwise of others. It is possible to divide people into those who react chiefly by means of empathy into human issues and responses and those who "systematise", who try to understand events - human or no - as to how they relate to the world of inanimate objects and nature. Libertarians score the highest of any group in respect of "systemizing". They are attracted to "how it is" rather than "how it should be". They revere evidence, science, facts, engineering and hard truths. In place of a system of morality deriving from emotion, libertarians have explicitly sought a "rational ethics." Indeed, as compared to liberals and conservatives, Libertarians are less likely to see moral traits as being important to their core identity. In general, they score low on emotional reactivity. However, they do display high scores on one measure of emotional reactivity, the Reactance scale, which is a strong rejection of attempts by others to impose on their liberty, either through moral prescriptions or through legal or other means. Libertarians tend to be close to nature, but have an instinctive and general aversion to environmentalists, precisely because the latter are brim-full of prescriptions, normative values and authoritarian personalities who must tell people how to behave. This is at least one reason why Libertarians also prefer a small state. The want a minimal claim on an individual by the community. Libertarians believe as a deep moral truth that a person has to make their own way, and that only those harmed by circumstance beyond their control are due sympathy. Quote from the paper: "Libertarians do indeed reject this morality, as well as all other moralities based on ideas of obligation to other people, groups, traditions, and authorities. 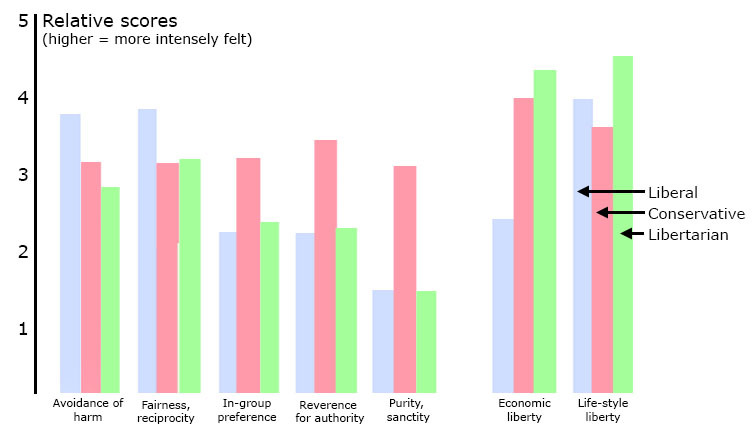 Libertarians scored relatively high on just one moral concern: liberty." The chart shown above looks at the attitudes of Liberals, Conservatives and Libertarians to social groups at three scales. On the left, we have the notion of a universal society, the concept of there being implicit and reciprocal obligations between humans. 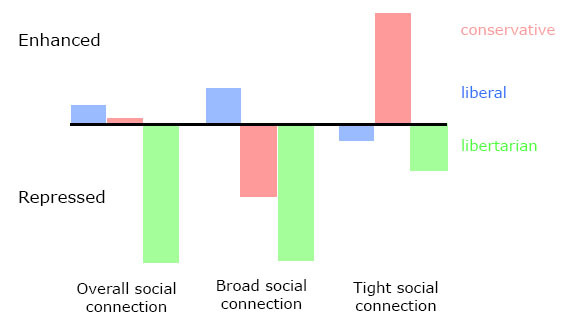 In the centre, we see attitudes to the real social connections that a person may have to the local community, to those at work and so forth. On the right, we find attitude to the narrow in-group and to the family. Liberals tend to lie around the centre line, because the liberal outlook has been the zeitgeist of the past generation, an official set of truths as powerful as were Nation, Queen, Empire and muscular Christianity to the Britain of 1900. Conservative groups are not keen on broad community claims upon them, and extremely strong in their bonds to the narrow community of class and family. Libertarians do not like other people at all, but feel a bit better in absolute terms about their immediate group than do conservatives about the broad community. It is hardly surprising, therefore, that Libertarians tend to be against Big Government. This is why many are now embedded in the US Republican party. However, their opposition to, for example, high taxes is not just an economic position: it is a moral position as well. As I said at the beginning of this piece, there is a loud voice in US politics that is repressed through the lack of a political platform. It found something of a voice in the Tea Party movement, but that was hijacked by other interests. It is equally strongly present in European society, but talked down by - amongst others - the media. Public Europe is not comfortable with such views. In the developing world, however, the older generation of the middle classes tends to be extremely conservative and the younger, perhaps in reaction to this, Libertarian. Their flavour of this is essentially pragmatic in respect of economic activities, not much interested in social issues, extremely keen to avoid being told what to do by others and disrespectful of authority, family and other sources from which such orders tend to come. We may need to become used to the Libertarian voice. It is, of course, our original triangle, but with the Libertarian axis added to it. What is interesting is what happens when you connect it all up, as shown by the lines. Top right are all those who see something wrong with contemporary social and economics dynamics, and want to put it right through rational means. "Why won't they listen?" is their theme song. Top left is the uncomfortable cohabitation between conservatives and the sometime ultra Libertarians: chiefly a locus of economic dialogue, perhaps. The traditional, now very tired Western dialogue runs across the middle, with both Liberals and Conservatives re-locating themselves up or down the figure. That is why the traditional parties find it so hard to locate a candidate, and so hard to produce anything but "somethings for everyone, offend nobody" mush. Social conservatives and the religious live lower left. The caring, sharing, welfare and revolution group sit at the lower right. 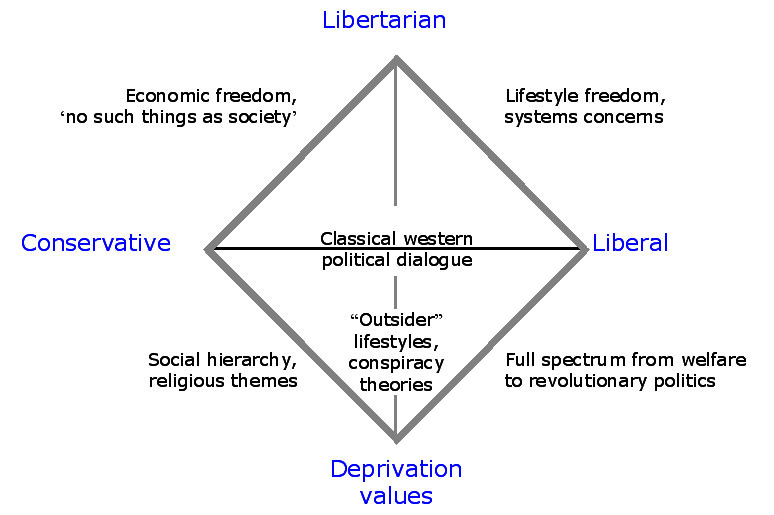 An interesting axis is the vertical one, between the politics of dispossession and the Libertarians. There are supposed to be six million people who are actually living as survivalists in the US, with many multiples of that broadly in sympathy, adherents to assorted conspiracy theories in which elites manipulate things from the background, politicians are puppets and government a fake. Most emerging economies and virtually all poor countries are (probably) located on the lower left. To the extent that they use the language of the left, then tend to drift into the terrain of conspiracies and plots. Of course there are other voices, but the social conservative and the dispossessed fight out battles as old as history in countries where the institutions have yet to mature. Pew publish social surveys. Their 2012 finding is that over the last four years, US citizens self-identifying as "lower class" has risen from a quarter to a third of the population. The greatest growth is amongst young whites, with black respondents remaining unchanged. A full 40% of Hispanics see themselves in this way. Politically, the main rise has been amongst Republican supporters and Independents, although Democrats report the largest proportion of lower class identity. Independents have shown the greatest downward mobility, as have those with a conservative outlook. Liberals have, by contrast, barely changed in their self-identification, although like the Democrats, they are the highest group numerically in the lower class. When asked which party stood for the poor, all social classes agreed with almost the same numbers that it was the Democrats. Only 10% of the sample thought that the Republicans stood for the lower classes. Inter-generational social mobility suggest that the lower class is difficult to leave, and that the upper class undergoes extreme churning: its members were equally born across the social spectrum. The middle class gets sprayed across the social spectrum. Four in ten US citizens have experienced net downward social mobility during their life times. All classes agree that it is harder to get ahead now than ten years ago. However, attitudes to the future vary sharply across the classes. The lower classes say that they are in wore financial shape than before the recession, that they are less secure, that they are very pessimistic about the future and about their own retirement. None of that is true of the upper classes. The lower classes are equally split as to whether hard work brings success, whilst three quarters of upper classes - and two thirds of the middle class - agree that it does. This said, overall life satisfaction remains high in all classes but lowest in the lower classes, between 20 and 25% of whom are unhappy with their education, family situation and housing. (Sixty percent are unhappy with their financial situation.) The upper classes are 90+% happy with everything but money, and 85% of them are happy with that. The middle classes have similar but slightly lower scores, with 72% happy with their financial situation. Within the lower classes, the groups reporting the most extreme pressures tend to be young, black, ill-educated, living in rented accommodation and unmarried. Women are mildly less happy than men. Eighty percent report significant health problems versus a half of the upper classes. only 13% did not see themselves as stressed, versus a third of the upper classes: choosing the flower arrangements, presumably. Only 10% of the upper classes said that they were failing to make career progress, as against 39% of the lower classes. Only 7% of the upper classes disliked their jobs, versus 28% of the lower classes. Movement has occurred across much of the scale. The primary flow has been middle class into lower middle class (here a part of "lower class") and from upper middle into middle. The 2% who score as upper class have not changed. As expected, the flows reflect educational status: 12% of college graduates self-identified as lower class in 2008, which rose to 17% in 2012. Middle skills changed from 24 to 36% and low skills from 32 to 41%. Remarks on the diagram in Comment 16: Frankly I find it a bit simplistic that positive change is only in the upper right. My first concern would be that the abandonment of community values leds to less trust in the Fukuyama sense, thus less division of labor et al. For the vertial axis, deprivation values are indeed problematic, but it largely depends on whether the group identify with is currently or historically powerful or not. Have you noticed that having any ideology, left or right, liberal or conservative, is the luxury of those nations that tend to win wars and not lose (or not much) territory and population to conquering neighbors? The rest hardly has any other choice but bitter, paranoid nationalism without much ideology (lower center, kind of), the ressentiment and fear factor being so strong. We can easily agree that being in the upper half breeds success, but also on the other hand, success and power and thus national or other group-level self-confidence is the prerequisite of getting in the upper half, as in, having good reasons for not being afraid, not feeling like a besieged town, is the prerequisite of going in the upper half. You have to feel that your group is so strong that it can easily defend its share of the pie, so you can focus your efforts in growing the common pie. Otherwise, it is the zero-sum (negative-sum) scramble of the lower half.